Darren Ferguson has urged his Doncaster Rovers side to put daylight between themselves and the League One danger zone over this festive period. Rovers kicked off their busy Christmas calendar in the best possible fashion with a hard-fought 1-0 win at Bristol Rovers on Saturday. And Ferguson says they must really make that result count by following up with victory over struggling Northampton Town on Boxing Day. “Anyone that shows a level of consistency over the Christmas period in terms of picking up points will pick up places,” said Ferguson, whose side rose to 14th in the table after their weekend win. “If we are one of those teams then you’ll probably see quite a bit of daylight between us and the bottom. “Also, we’ll probably be closer to the play-offs - but we’re nowhere near that yet. I just want to concentrate on what we can do this season. “It’s about trying to be consistent. We wanted a result going into the two home games. “Recently I’ve been pleased with the performances at home. With Rovers still having not earned back-to-back league wins this season, Ferguson admits it would be the ideal time to tick it off the list of achievements. 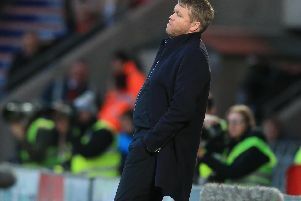 And he backed them to do so if they show the same attitude on Boxing Day as they did at the Memorial Stadium. “We’ll take it a game at a time,” he said. “Let’s try to get that win and tick the back-to-back wins off. “We don’t want to get a fantastic result at the weekend and then waste it on Boxing Day. “Certainly we feel these next two are winnable going to into them. “And certainly the players have shown the right attitude for the game. James Coppinger is in line for a recall against Northampton following his groin injury. The 36-year-old did not travel to Bristol despite being fit, with Ferguson opting to keep him fresh for the run of three games in six days. “There was no way Copps would play that many games in that space of time,” Ferguson said.